The plethora of fantastic beers on display was awe-inspiring. Each brewery got a chance to shine. I liked that this meant something different to each brewery. Some put their best foot forward in the form of an aged stout while others chose to showcase a hop in a sublime way. No matter which path a brewery chose, they ended up at a destination that wowed us. I love the flavor profile of a Molé stout. It’s a wonderful sip when you get the smokiness of the chili, the bitterness from the chocolate, and then a little burn at the end. I am excited to see Steve Finnie get creative with flavors as Little Thistle showcases what they can do with a stout. This beer has a comforting, yet exotic flavor profile and the body is substantial. 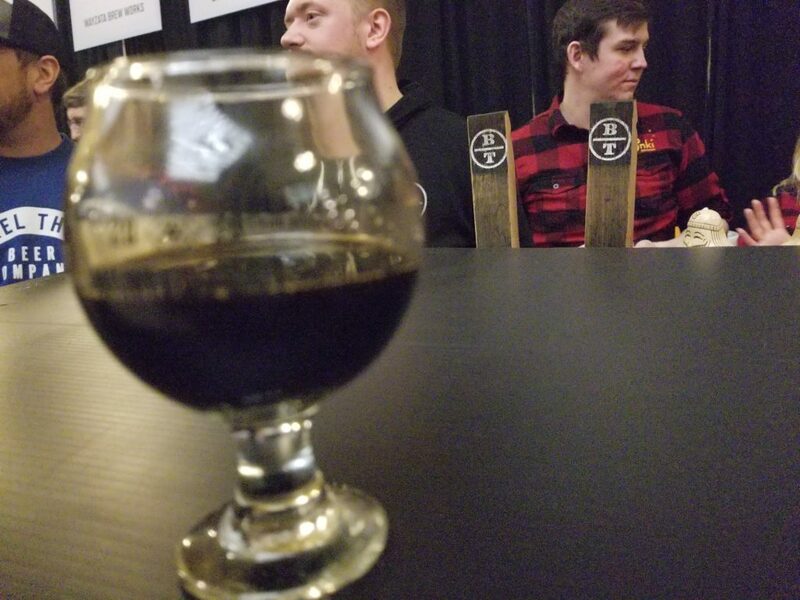 For a Russian Imperial Stout to stand out at Winterfest, it has to be brewed masterfully. Luckily, that is exactly how Unmapped Brewing handled Ruby Stout. The Ruby Stout came across as flavorful, chewy, and warming. It had the perfect balance of roasty malt bitterness that imparted a nice dark chocolate and coffee note in the beer. The Ruby Stout finishes a little sweet to round out the sip. Sip, ha, let’s be honest, I did 2 pours of it because that’s how I roll. A sensational showcase of toasted bread and caramel flavors, the Revelation Ale Works Double Brown Ale was superb. Between this and the beers of theirs I had last year at All Pints, I am going to have to finally visit the brewery. Such depth of flavor in a brown ale is something that Minnesota lacks, overall. Michigan has it, Oregon has it, why can’t we have it? I shouldn’t have to drive all the way up to Revelation Ale Works to get a good brown ale. Some of the best beers are the simplest beers. Finding a balanced pale ale in Minnesota that has the right harmony between bready malt and fresh hops is harder that Jean Claude Van Damme’s glutes back in the day. 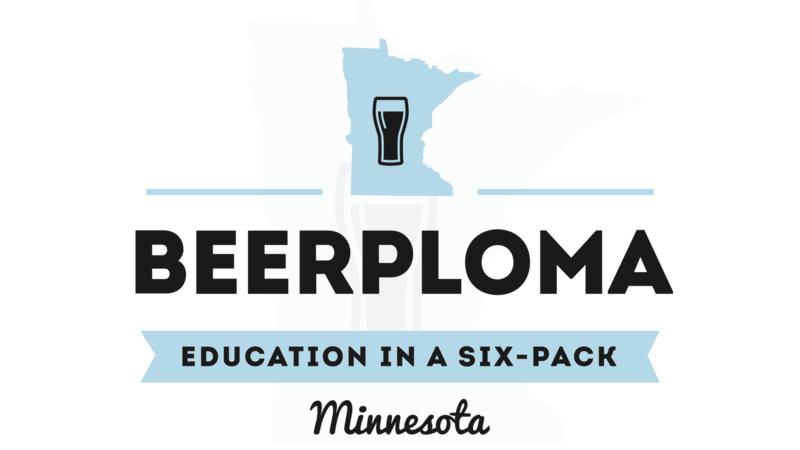 Most of the pale ales in Minnesota are murky and astringent. It took a trip out to Oregon for me to realize that I don’t hate pale ales, I just hate the way 98% of them are brewed here. This is why I was so enamored with the Three Twenty Brewing Company’s Pine Camp Pale Ale. It is bright, hoppy, and refreshing. When you are dealing with one hop, you have to know what you are doing and Nick Olson did a bangup job with this one. I will have to get into the taproom sooner than later to try more of their beers. 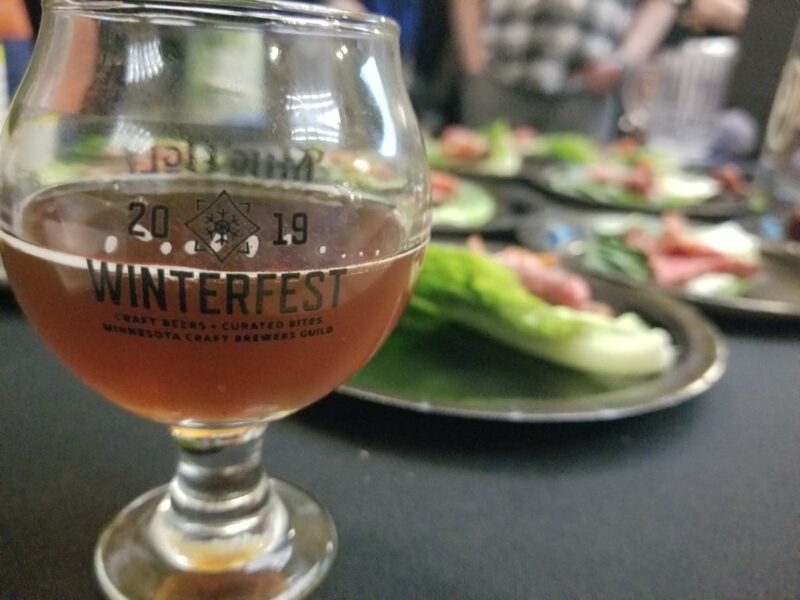 The focus of Winterfest 2019 was beer pairings. After last year, I am happy to see that the marriage between the bite at each table and the beers being poured was easy to figure out. So, here are the five beer pairings that I thought really hit the mark. There is something really wonderful about pairing beer with cheese. I was excited about this pairing when I first looked at the program and the tasting did not disappoint. The Tin Whiskers cherry berliner weisse is tart and light-a scrubbing bubbles effervescence in the beer clears the palate to make way for flavor. The goat cheese in the quinoa salad from Red Stag was good because quinoa had a nuttiness that paired well with goat cheese. The tartness from the beer canceled out the tartness from the cheese to emphasize the funkiness of the cheese a little more. A beer pairing success is putting it mildly and I hope you got a chance to try this if you were there. A match made in Deutschland! The Munich Dunkel that Jack Pine was pouring had a nice caramel and dark bready malt flavor with a nice body to it. This allowed for it to stand up well to the Lowry Hill Meats pork sausage that was rich and juicy. The braised cabbage tartness cut the richness of the beer and allowed for the rye crumb to highlight the beer’s rye bread malt character. On its own, the Munich Dunkel is a good beer, but with this delicious bite, it was elevated. This was a combo I kept circling back for. I love the Summit 120 Schilling on its own. It is a rich and roasty beer that has a great chewiness to it. When paired with the Finer Meats & Eats amazing duck sausage roll, the fat from the duck sausage cut a bit of the edge from the roasted malt away to unearth a nice rich caramel and toffee flavor on the beer. If that wasn’t enough to get my beer pairing undies in a bunch, they also had duck fat caramels. Holy shitballs, were they amazing. It was so much lovely umami flavor and if there is one thing foodwise I will remember forever, it is the caramels. 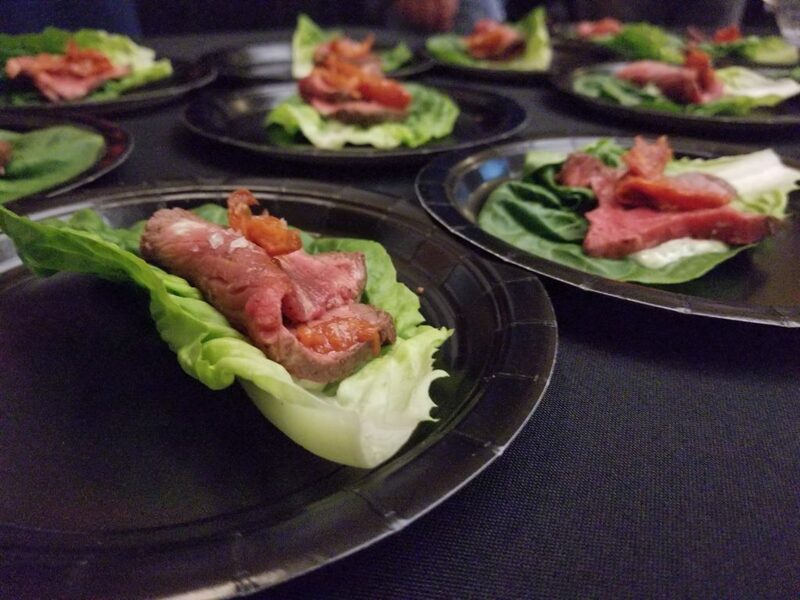 All in all, this combo illustrates why when pairing beer and foods, a strong beer holds up nicely to a bold and fatty bite of meat. If you believe that hell will have better beer in the afterlife then obviously this pairing earned you some gluttony points. The Hard Left stout from Spiral Brewery in Hastings was a wonderful combo of sweet, roasty, and smooth. There is a lot of chocolate notes along with some sweetness that is almost like a small touch of vanilla. The body of this beer stood out the most to me-a sturdy base supporting all those rich flavors. The foie gras mousse from Nosh had two sauces that you could try-a salted caramel and a chipotle-in the interest of science and being gluttonous, I tried them both. Boy howdy, was that the right choice. Such a decadent mix of sweet and savory flavors all coming together in the smoothest texture you can imagine. Not only did this bite pair well with the Hard Left, but I tried it with a few other stouts as well. 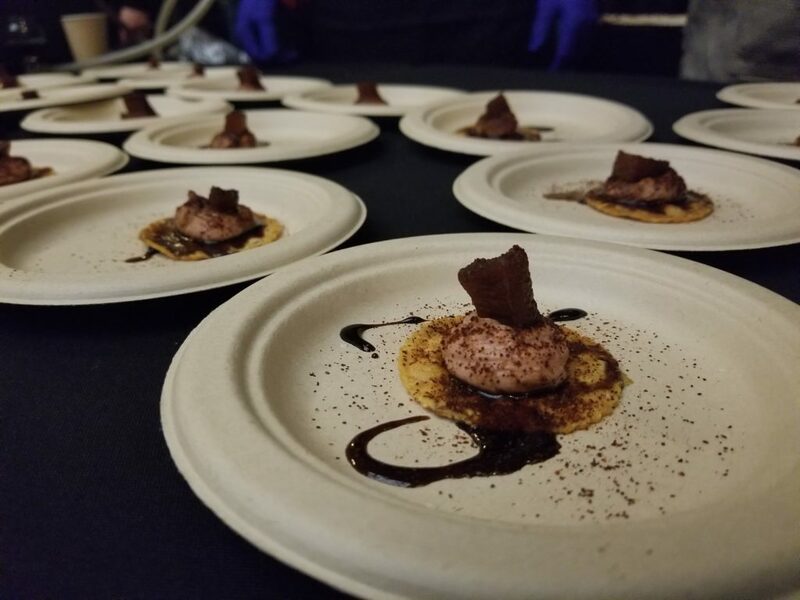 I think that this rich and divine marvel from Nosh epitomizes what Winterfest is all about. I have mentioned the libations and culinary concoctions that made the night memorable. 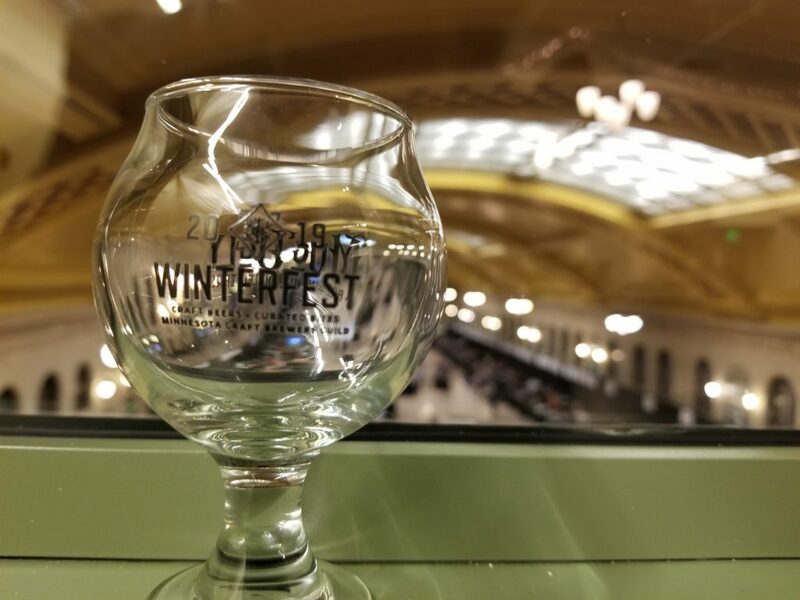 However, there were a lot of other things that the Minnesota Craft Brewers Guild did well to make Winterfest 2019 a success. Having a clear idea between the beers and the food was smart. At first, a quick glance of this year’s program made me think that maybe the foods were not going to be as good. Absent were my favorites from last year-Spoon & Stable and Travail-and I was worried that the food was going to suffer. I literally ate my words. I thought that the food was fantastic. Last year, there were stations running out of food by 8:00 and that did not happen this year. It was also nice to hear that a lot of the breweries brought beers to go with the food-another thing that wasn’t consistent from last year. The water stations were easier to find and I never felt like I had to search for a dump bucket. I hate to be rude and dump a beer poured by a brewery I respect, but when you are trying to taste your way through a lot of beers, it is a necessity. So I was glad that there were dump buckets located in the middle of the venue. Good call on the smaller tasting glasses! Instead of a 10 oz. tulip glass, a nice 5 oz. goblet was the tasting vessel this year. I believe this also helped people moderate what they were drinking. I love the big tulip, but it is also easier to get into one’s cups faster that way. The fact that I was at the coffee shop by 8:30 the next morning is evidence that the 5 ounce taster agrees with me. Lastly, I think that the Union Depot is such a perfect venue for this event. It never felt crowded. There is an elegant feel to the place and I like that when I am dressed up and drinking fancy beers. Target Field was a definite misstep and I am glad to see that they have been back at the Depot for the last couple years. I have to tip my cap the the Minnesota Craft Brewers Guild, they definitely improved after last year’s mixed reviews. I want to give a shout out to Jess Talley, for not only providing me with a pass to the event, but also the lovely conversation at the festival. Tess had way more important things to do than talk to me and the fact that she did speaks to the type of person she is. I am already making my paper chain to count the days until next year. 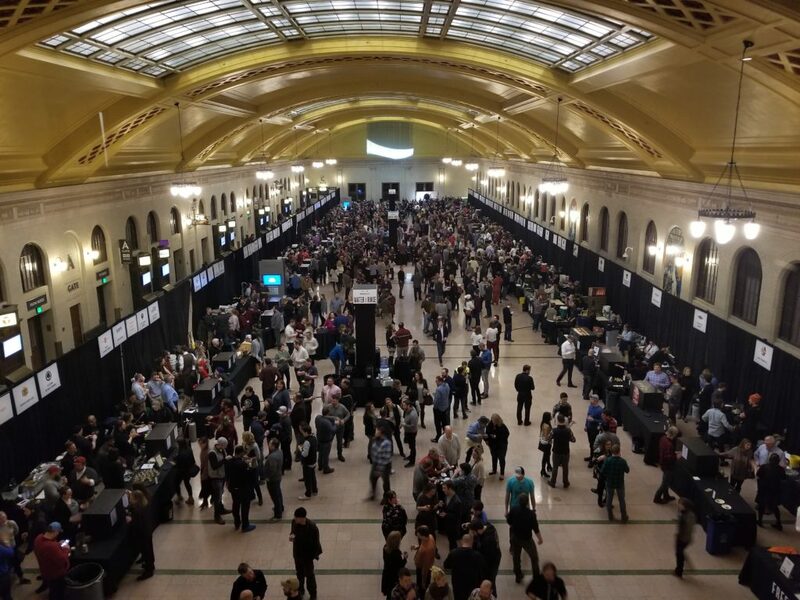 Between the beers, the bites, and the people, Winterfest 2019 was a fantastic showcase of Minnesota beer and food. Prost!